Where Now For The British Far-Right? But, even so they're very easy to make fun of, we should never forget the fact that, given a chance, they still could manage to gain political power one way or another and then, that freedom of speech they're allowed to have (and abuse on a daily basis) would not exist anymore for those who, like us, openly oppose them. So yeah... The EDL and the BNP are a joke at the moment, but they're also still dangerous. Here is an email from Nick Lowles of HOPE not hate I've received today and would like to share with you. If you have time, please do check out the article he mentions in the email. The British far-right should be having a ball. With the economy faltering, austerity biting and economic pessimism growing, the conditions for racism and racist scapegoating could hardly be better. But racist groups are contracting and morale is dropping. Will it always be like this? I’ve just co-authored an essay on the current state of the British far right and I would like you to read it. It charts the recent decline of the British National Party following its disastrous defeat in Barking and Dagenham. 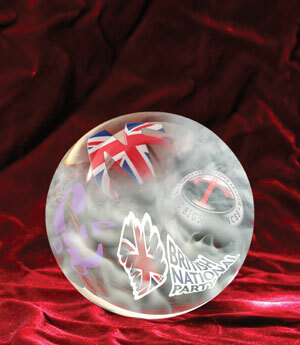 It examines how the English Defence League appeared to be replacing the BNP as the main far right threat, but no more. Thousands once joined EDL marches and they counted over 90,000 supporters online but this now seems a distant memory as the group declines amid internal warfare and demoralisation. The economic conditions and disillusionment with mainstream political parties should be perfect for racist politics. Research shows that economic pessimism is a key driver in attitudes towards ‘outsiders’ and there is certainly a lot of pessimism about. Our essay looks at why the British far right is so fragmented and examines who will gain in any upturn. Worryingly, we also look at the prospects for increased racial violence and terrorism. We have written this essay to help us decide a strategy for the next couple of years. Over the next few weeks we will be using our website to host a discussion on the future of the far right and to help us shape our response.